Romantic, warming, atmospheric, dangerous to the wellbeing of your carpet. All words to describe a candle. Now it’s winter more of us will be lighting them, and as Christmas draws near they will be everywhere. Just make sure that doesn’t include on your carpets and soft furnishings. Second only to red wine, candle wax is the most common ‘accident’ we are called out to deal with. 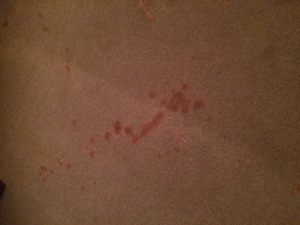 The photo above shows what happens when you knock over a red candle and the molten wax splashes on a new wool carpet. Its fair to say that the husband who had this accident was not popular with his wife. Fortunately he had the sense to call The Rutland Cleaning Company before attempting anything himself and we were able, after much effort, to remove all traces of the wax. If the same happens to you there are some steps you can take to help yourself. 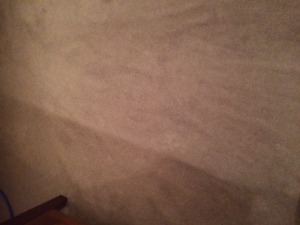 You can pick away at the large lumps of wax, but be careful in doing this not to damage the fibre of the carpet. Once the bulk of the wax is removed you could attempt to remove the rest using a heat source, usually an iron, and some absorbent paper. This technique should ONLY be attempted if the candle was white in colour and the carpet is made of wool. In any other circumstances you will risk damaging the carpet by the heat or risk leaving behind the dye from the candle as a permanent stain. If you are unsure contact us and we will attend armed with our specialist spot and stain kit and remove the offending wax .